Set price from: 2,434.00 USD* / 3,028.00 CAD* / 2.398 EUR** (Men's ring: 14K palladium white gold with 14K warm yellow gold interior and feather inlay of 14K red gold; Ladies' ring: 14K palladium white gold with feather inlay of 14K red gold. What do you get by adding 8 and 9? Jeweler Zhaawano constructed these wedding rings of a sleek and modern design of 14K palladium white gold (or palladium white gold with a yellow gold interior). The warm color of the red gold eagle feather inlays contrasts beautifully with the cool, grayish color of the ring shanks. 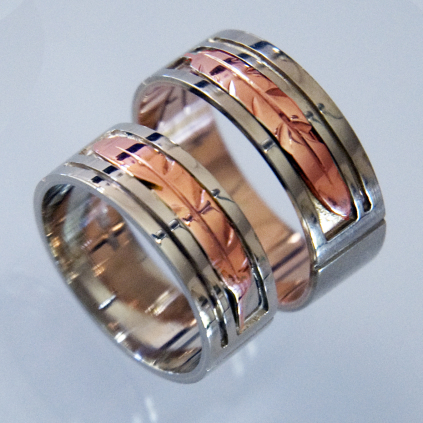 These unique wedding bands can also be executed in multiple gold colors and widths. The wedding rings symbolize the journey of two companions sharing the spiritual, red road; a metaphor for bimaadiziwin, a way of life where being faithful to one’s origin and the well-being of one’s People are central, and where respect for oneself, each other, and one’s relatives and loved ones - but also for the larger world of all living things - is vital. In following bimaadiziwin the Seven Instructions (often called “Grandfathers”) that have been passed on generation to generation can serve as guiding principles along the road. Besides living according to bimaadiziwin and following the Red Road, the wedding rings depict the twofoldness of body and soul, and, in an even deeper sense, of matter and mind. The ring shanks, symbolizing matter and outward manifestation, reveal, in the shape of the recessed eagle feather, the ojichaagoma (soul or inner power) of both partners-for-life. The straight line that runs parallel with the cut out rectangular recession holding the eagle feather, images the inner journey they take together on the mino misko manidoo-miikana, the good red spiritual road. - The principle of Anishinaabe bimaadiziwin: how to live a good and upright life.